This article presents the author’s views on what Avaya needs to do to ensure success following its emergence from bankruptcy in 2017. These views are informed from long observation of Avaya’s performance and actions in the broader communications market in which it operates. These predictions have proven to be reasonably accurate. But what does Avaya need to do now that it is in an era where Cisco and Microsoft are very serious competitors? I made some suggestions to Avaya in 2006, many of which are still valid. I will recast them with a 2018 face on them to make them applicable to today. Messaging – I think the company’s executives must provide stronger, more visionary messaging. I’m willing to cut them some slack given that many of them are new to the industry or they are new to their particular position within Avaya. At Avaya Engage 2018, I was expecting to come away with some sense as to how Avaya is going to quit the hemorrhaging of its market share along with some specifics on how it is going to compete with Cisco, Microsoft, and Mitel, plus all of the mid-/ small-market cloud players. I didn’t really get this. Jim Chirico, the new CEO used a lot of platitudes in his keynote, employing words like simplicity, teamwork, empowerment, inertia, trust, people, accountability, and “our approach will be thoughtful”. I did not find these particularly insightful nor did they promote vision. Likewise, the CFO, Pat O’Malley stated that in 2018 the focus is on revenue stabilization and that fiscal 2019 will be about growth. I understand that Avaya needs to have these things, but it’s not clear to me how or why giving speeches with these generalities is helpful. Perhaps the intent of these addresses was an attempt project confidence, particularly following the harrowing financial situation Avaya was in. If so, I just didn’t get the confidence the keynoters were intending the audience to have. There were some other buzzwords used in the keynotes, like blockchain, AI, and IoT, but for the run of the mill attendee, these words do not convey anything about a strategy Avaya will use to win or tactics on how to do so. Key takeaway: Avaya needs stronger, clearer, more visionary messaging that can resonate in the market. I think it needs to be focused first on “Why Avaya now”, followed by “How Avaya now”. Again, the management team as a whole is pretty new. Perhaps the new capabilities presently in the works will allow it to plant a stronger vision in the minds of existing customers and new prospects. “Think Avaya, Think Cloud” – This phrase was used several times at Engage, and it is really enabled by the recent acquisition of Spoken by Avaya. Back in 2006, I encouraged Avaya to enter the cloud market. The company has tried to position itself as a cloud-based service provider for a number of years, but it never quite got there. In fairness, Avaya does have a healthy managed services business in which Avaya manages customer solutions. These can be hosted in the Avaya data center or on-premises at the customer location. But, these managed services have not been a cloud-based service in which a customer can sign up for UC-as-a-service. In principle, the Spoken acquisition changes this. Spoken has apparently built a database on top of Avaya’s Aura platform that allows Aura to appear to be a multitenant application, and this is one of the principle reasons why Avaya bought Spoken. We also saw some mockups of the Zang technology (the Zang brand is being retired) coupled with some features of IP Office, implying that IP Office will be available as a hosted service from Avaya, including auto provisioning of local telephone numbers. It was unclear how much of this was really a mocked-up demo and how much was really live and in production. Avaya really needs to have cloud-based UC services, and perhaps under this new management team, with Mercer Rowe at the head of the Cloud Business Unit, it will really happen. An important point to note is that Avaya has no plans to go direct with its cloud-based services: it intends to sell them through the partner channel (which brings up a host of issues trying to get partners to convert some or all of their business to a subscription-sell model). 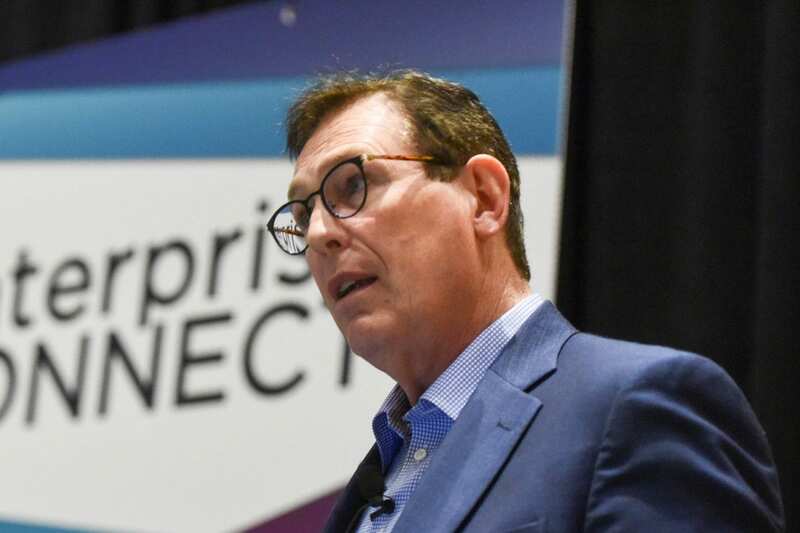 Key takeaway: Avaya needs to roll out a compelling UC-as-a-service offering that can target the SMB market as well as companies in the large enterprise market that behave like SMBs in the sense that they have lots of small locations. Verticalization – Being a “me too” telephony player is not going to be a compelling strategy in 2018 and beyond. There are already enough companies that can provide call control. Cisco and Microsoft are winning at communications because they sell adjacent products or services. Both have communications bundled in with a suite other products that companies need, such as networking or desktop software. Avaya tried this with networking, but just couldn’t get enough momentum to make a dent. Furthermore, if one looks at other competitors in the market, like Mitel, Unify, or Alcatel-Lucent, none of these companies are performing at stellar rates, and a market with small growth potential is not one Avaya wants to remain in. Avaya has got to do something different that just be a communications provider. To that end, another suggestion I gave in 2006 was to create strongly verticalized products that can win majority share in entire market segments. Avaya has talked about vertical markets before, and claims to be targeting a few verticals, like Healthcare and Hospitality. I think there needs to be enough energy put into a few big verticals so that Avaya could win majority market share in them and comfortably walk away from the general communications market, where call control commoditization will continue to occur. This will likely require developing or acquiring products and services that are outside of Avaya’s current offerings so that Avaya can create its own bundled offerings that are so compelling that large portions of a vertical market shifts to them. Key takeaway: Avaya should invest heavily to win in vertical markets to avoid being a big player in a slow growth market. Specialized products the market wants can usually be sold at premium pricing. New Products – Along with verticalization, Avaya is going to have to come up with some new products in adjacent or new markets that have significant profit potential. Avaya will be a consumer of blockchain technology, and while blockchain will not make Avaya money, per se, using blockchain in its products can make Avaya a thought leader with respect to data transfer and storage. Likewise, Avaya will not make money selling IoT, per se, but it can make money being a company that is heavily invested in the communications-enabled business process that IoT will require. When an IoT sensor triggers an alert, there will be a number of options depending upon the business process behind that alert. These may include an automated controller that handles the alert on its own (an area Avaya doesn’t play in), sending the alert to a big data store (an area Avaya doesn’t play in), and/or some notification or communications processes (an area that Avaya is really good at). Avaya could develop communications-enabled business processes for IoT-related activities that can take advantage of Avaya’s omni-channel communications capabilities. Artificial intelligence was mentioned many times at Engage. AI is going to enhance existing products and make them more compelling to users and to their managers. The IntelligentWire natural language processing obtained in the Spoken acquisition is one example of where Avaya’s existing contact center will be augmented by an Avaya-owned AI technology. The AI.Connect initiative is useful, but the range and scope of those offerings are confusing, even to someone like me that has a strong AI background. In order to make this successful for its AI partners and to Avaya’s channel, the company is going to have to work with these AI partners to make sure the channel partners 1) understand what the offering can do for the end user customer, 2) what data is required to make the AI solution work, 3) what Avaya and third party products are required for the solution, and 4) how much effort from the channel partner and the end user organization is required to implement it. From what I’ve seen thus far, AI.Connect partners are looking to Avaya as a channel for their own products, and it is not clear to me how or if Avaya will generate significant revenue for itself from this initiative. Perhaps Avaya needs to combine the capabilities of several of these AI.Connect partners into compelling bundles so that end user companies can pick and choose what they want from an orchestrated, coordinated solution offering. One of the most exciting areas for me was the discussion about a few new products currently under development. Analysts are under NDA respecting these solutions, but my impression is that at least two of these products look like the kinds of things that could have come from Bell Labs. A third has an opportunity to be disruptive in a market adjacent to what Avaya sells today, but which could balloon and disrupt a third much larger market if the company can protect the intellectual property and seize on first mover advantage. Key Takeaway: Avaya is investing in advanced products and services that can make it a thought leader in certain communications-related functions as well as in a few adjacent markets where there is significant revenue potential. The company needs to sharpen its messaging, seeking for ways to instill vision in the hearts and minds its partner channel and its existing customers and new prospects. Avaya needs to stop talking about getting to the cloud and execute so that it does so. Hopefully Mercer Rowe can make this happen in a way that doesn’t alienate the channel away from cloud sales. The company needs to really focus on developing products and services for a few key verticals where the Avaya can win overwhelming market share, which will help it avoid the challenges of a slow growth communications market. Avaya needs to develop products for new markets that Avaya doesn’t currently serve or in market adjacencies that can in turn expand to additional adjacencies. This is possible given what we’ve heard is in its labs. Very clear go-to-market and monetization strategies will be required to do this, but if it can succeed, this will lift Avaya out of the slugfest for communications market share and broaden its portfolio of offerings. Brent Kelly is Principal Analyst at KelCor, Inc. where he provides strategy and counsel to CxOs, investment analysts, VCs, technology policy executives, sell side firms and technology buyers. He has made measurable real-world contributions in multiple industries including telecommunications, manufacturing, electronics, oil field services, chemicals, and mining. Brent has a strong background in numerical methods and applied artificial intelligence along with significant experience developing IoT solutions. He has written hundreds of articles and reports in the unified communications and collaboration industry and regularly delivers webinars and thought leadership addresses at public and private events. Brent has a Ph.D. in engineering from Texas A&M University and a B.S. in engineering from Brigham Young University. Dr. Kelly has served two terms as an elected official in his community and is co-owner, with his wife, of a gourmet chocolates manufacturing company.